Seven recent Washington Township High School graduates returned to speak to current WTHS juniors and seniors on December 20th. Pictured (clockwise from bottom left): Cassidy Coppola, Matteo Murgia, Charles Reamon, Dahlin Hackley, Remi Strand, Abby Haley and Alyssa Petner. 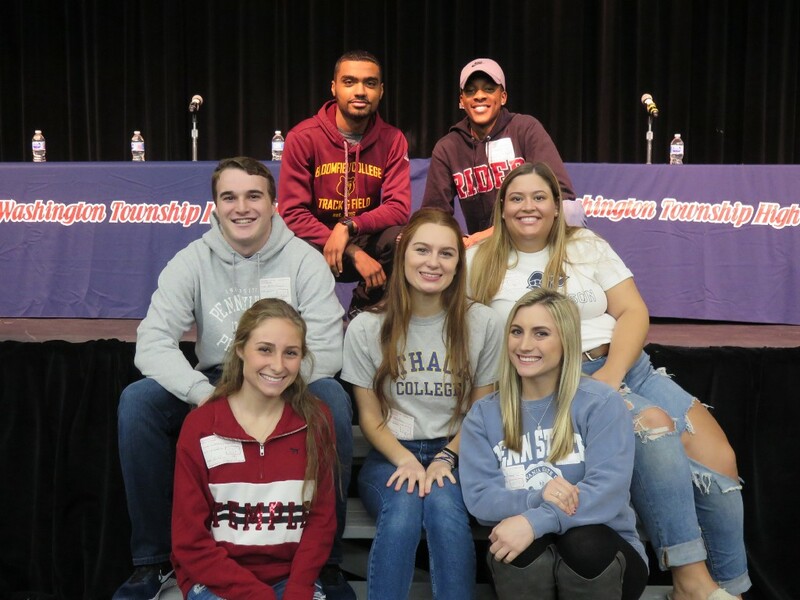 As an auditorium of mostly seniors and juniors quickly learned from a visiting panel of recent Washington Township High School graduates and current college students on Dec. 20, the challenges that come with transitioning to college are consistent from small campus to large campus and from major to major. The seven alumni panelists, organized by WTHS school counselor Karin Carpenter, were in agreement about the topics of most importance: preparing yourself now for life beyond high school, learning to manage your time, seeking scholarship opportunities and financial aid, securing work-study positions and part-time work, making connections with professors and peers, finding a school that fits your needs and aspirations, finding your passion and setting yourself up for success. Cassidy Coppola (WTHS Class of 2015- Temple University), Abby Haley (WTHS Class of 2016- Ithaca College), Dahlin Hackley (WTHS Class of 2015 — Rider University), Matteo Murgia (WTHS Class of 2016 — University of Pennsylvania), Alyssa Petner (WTHS Class of 2014 — Penn State University), Charles Reamon (WTHS Class of 2016 — Bloomfield University) and Remi Strand (WTHS Class of 2015 -Jefferson University) shared anecdotes and sound advice on what they encountered during the crucial transition period into college.